Contact person: Coria Tourist Office. There are documents that attest to the existence of a pre-Roman Coria, known as "Caura" until the 1st century BC when the Romans re-named it Caurium. It became an Episcopal seat in Visigothic times. The Moors ruled the town from 711 AD until Alfonso VII reconquered the town in 1142 and restored its Episcopal status. In the following centuries Coria stood out as a big contributor of manpower to the exploration of the Americas. It is also the place where the first book was printed in Extremadura in 1489. Coria was made a constitutional municipality in the 19th century. It was not until 1959 that the Episcopal seat was transferred to Cáceres, though Coria still maintains its diocesan status. The best place to start on an exploration of the streets of Coria is by entering the wall by the San Pedro gate, which dates back to Roman times, as does the Guía gate. Nearby you have the Convent of the Madre Dios, with its Renaissance cloister and an interior that's well worth a visit. Also worth a look is the Baroque Church of Santiago ( 16th-17th century), which stands near Plaza de España. 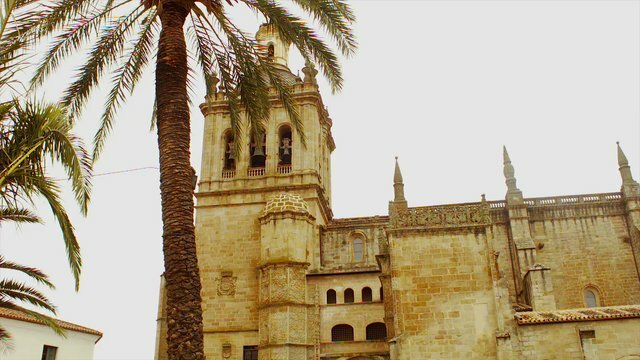 Continue on until reaching one of the most remarkable monuments in the town, the Cathedral of Santa María de la Asunción where you will no doubt take time out to admire its Plateresque façade and tower, as well as its two Churriguera designed doors. Inside, the 18th century main altarpiece, the choir and the main chapel's rails are particularly interesting. The Cathedral Museum is also well worth a look in. From here you can go and see Coria Castle (15th century) which was built over the town's wall. The stone bridge over a dry channel is also worth a visit. This construction gave rise the popular expression "bobo de coria" (buffoon of Coria), first applied to whoever it was that decided to build a bridge in the absence of a river. The fact is there really was a river, the Algón, which used to flow under the bridge until a heavy flood in 1590 diverted its course away from the bridge. It later occurred to someone to personify the illustrious "buffoon" in the person of the jester, Juan de Calabazas, a native of Coria, who was painted by Velazquez when offering his services to the court of Philip IV. The painting thus became known as "The Buffoon of Coria". The aforementioned architectural heritage, the most noteworthy in the town, is further complemented by Baroque buildings such as the Episcopal Palace, the Ermita de Nuestra Señora de Argeme chapel, the Ducal Palace and the Cárcel Real Museum. The Sanjuanes fiesta (23-29 June) is another mark of the town's identity and an integral part of its cultural heritage. The most important festivity in the town, it has been declared a Fiesta of Tourist Interest in Extremadura. It is an ideal occasion on which to sample the traditions, hospitality and excellent cuisine that Coria has to offer. However, if it's a more relaxing atmosphere you're after, we would recommend you experience the Easter Week festivities in Coria, which are equally as important and no less special.